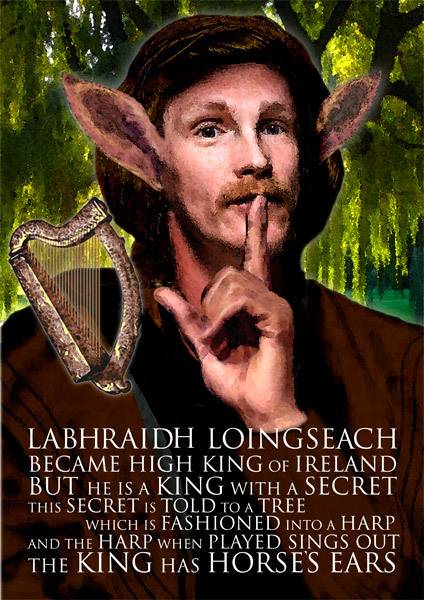 There was once a High King in Ireland called Laoghaire Lorc. He had a brother named Cobhthach, who was the King of Leinster. Now, although he was a king in his own right, Cobhthach became intensely jealous of Laoghaire. Everything Laoghaire did, he saw as a sleight against him, and every victory of Laoghaire‘s felt like a blow to Cobhthach. His jealousy grew and festered so much that he fell sick from it, and his flesh wasted away, and he became thin and gaunt. And people began to call him Cobhthach Caol, which meant miserable. Laoghaire came to visit Cobhthach Caol one day, knowing only that his brother was sick. When he was coming into Cobhthach Caol’s house, he accidentally stepped on a little chicken that was scratching in the dirt by the doorway, and killed it. Now, when Cobhthach saw this, he took it as proof that all his jealousy was justified, that Laoghaire really was out to get him, and that he was cruelly tormenting Cobhthach. And after Laoghaire left, he began to plot and scheme how he might kill his brother. Cobhthach Caol came up with a plan. He told his servants to put the word out that he was dead from his wasting disease, and to lay him out on a bier as if he were dead, and to put a knife in his hand, and to say nothing to his brother Laoghaire when he came to grieve. Cobhthach Caol waited there, till Laoghaire approached, and, grief-stricken, threw himself on his brother’s body to weep. Then Cobhthach Caol stabbed Laoghaire with the knife, killing him. After that Cobhthach Caol won the kingship of Ireland. He was worried that his brother’s son might oppose him, so he invited Laoghaire’s son and daughter-in-law, Áine, along with their young son, to visit. There he killed Laoghaire’s son, and forced the little boy to eat his father’s heart, and to swallow a mouse with its tail. The poor child was so overcome with disgust that he lost the power of speech, and he became known as Maol, which means mute. And Cobhthach was satisfied with this, because no man with such a defect as muteness could ever be a king in Ireland. Áine brought Maol Loingseach to Corca Duibhne where he grew up into manhood. Then one day, while he was watching a game of hurling, Maol grew so excited that the let out a shout! All the people watching said “Labhraidh!” which means “He speaks!” and from that day on, Maol Loingseach was known as Labhraidh Loingseach. Knowing that he was at risk if his uncle, Cobhthach Caol ever heard that his speech was restored, Áine advised Labhraidh and some of his companions to go to France. There, Labhraidh’s friends told the King of France that Labhraidh was the grandson of the High King of Ireland. The French people put great stock in this, and the King of France put Labhraidh in charge of an army. He did so well at this, and won such great renown, that the King’s Daughter of Munster, Moiriath, fell in love with him from afar. Moiriath got the great poet and bard Craiftine to help her to win Labhraidh Loingseach’s heart. She composed a love-lay for Craiftine to sing, and sent him over to France with love-presents for Labhraidh Loingseach. Labhraidh was delighted by Craiftine’s playing, and when he heard that the love-lay had been composed by Moiriath, he was very impressed. He decided to leave France and sail back to Ireland to meet this woman. Now, Moiriath’s mother was well aware of what a talented and beautiful daughter she had, and she was determined that she would not be seduced by any man, before she had the chance to make the best possible marriage. So, each night, she sat herself outside her daughter’s bedroom to keep watch. This she did by letting her left eye sleep for one half of the night, and keeping the right eye open, and then letting her right eye sleep the second half of the night, with her left eye always open. When Labhraidh arrived in the King of Munster’s hall, he was given a great welcome, and a wonderful feast was laid out, but the King of Munster did not give Moiriath and Labhraidh a moment alone together, being just as over-protective as his wife. Labhraidh didn’t know how he was going to get to be alone with Moiriath, though, having seen her, he was as in love with her as she was with him. The poet Craiftine offered to help the lovers again. When the feast was over, and everyone had gone to their beds, he told Labhraidh to block his ears. Then Craiftine played the Music of Sleep on his harp, sweetly and softly. All those still awake fell asleep, and all those asleep slept deeper, and Labhraidh was able to sneak past the sleeping Queen of Munster, into Moiriath’s room. The next morning, Moiriath’s mother knew at once that her daughter had spent the night with a man. She brought her before the king, and they both demanded to know who it was so they might kill him, but Moiriath said nothing. Labhraidh stepped up and admitted that it was he, and that he and Moiriath loved each other. When they heard this, the King and Queen of Munster were mollified. If she had to be with a man, they reasoned, at least she was with such a fine young man as this. And so they gave their permission for Labhraidh and Moiriath to be married. After they were married, Labhraidh realized that he had amassed so many followers, from France and from Munster, that he need have no fear of Cobhthach Caol any more. So, he and his men returned to Leinster, where he claimed the throne. Cobhthach Caol was none too pleased by this: he was still High King of Ireland, but there was no way of going against Labhraidh Loingseach but to go to war, so he kept his peace for the time being. Meanwhile, Labhraidh employed all the men and women of Leinster in a great undertaking. He had some of them make iron nails, and others make iron roof-tiles, and others make iron bricks and iron timbers, still others to make iron doors and iron hinges. And it was said that the people of Leinster at that time were so close-lipped, that none of them ever said to their friends or families what it was that they were employed in the making of. And so in this way, Labhraidh Loingseach was able to build a great house all out of iron, with no word of it getting out. When the house of iron was ready, and all clad in wood to disguise it, Labhraidh Loingseach sent an invitation to Cobhthach Caol. He invited him to come to a feast, to make peace and settle things between the two of them. He told Cobhthach to bring as many men as he needed to feel secure, and promised that he would not attack them. Cobhthach Caol was suspicious, but after many reassurances, he finally agreed. He brought his whole army with him to Labhraidh’s iron house, and when they got there, they saw the feast laid out inside, but none of Labhraidh’s people in there. At that, Cobhthach Caol’s suspicions all came back, and he refused to go inside the iron house. Then Áine stepped forward, and she went into the iron house ahead of them, knowing full well what her son had planned. She nodded to Labhraidh as she went inside, to tell him that she understood and agreed with what he was about to do. Reassured, Cobhthach Caol led his whole army into the iron house. As soon as the last man was inside, Labhraidh Loingseach bolted the doors. He had his men pile wood up outside the iron house, and he lit the wood on fire. The walls of the iron house heated up like an oven, cooking all the men inside, giving them a gruesome death, and avenging the terrible wrong that Cobhthach Caol had done to him, a vengeance that Áine bought with her own life. After this, Labhraidh Loingseach was made High King of Ireland, and ruled well and wisely for many years.